EUR/USD kicked off the week with a weekend gap to the upside but was unable to hold onto the gains. What’s next? The Technical Confluences Indicator shows that the pair is struggling with 1,1368 where we see a dense cluster of lines including the Fibonacci 61.8% one-week, the Bollinger Band 15min-Middle, the Fibonacci 23.6% one-day, the Simple Moving Average 200-4h, the SMA 50-15m, and the BB 15min-Upper. Robust resistance awaits the pair at 1.1393where we see the convergence of the SMA 100-1d, the Fibonacci 61.8% one-day, the Fibonacci 61.8% one-month, and the BB 1h-Upper. 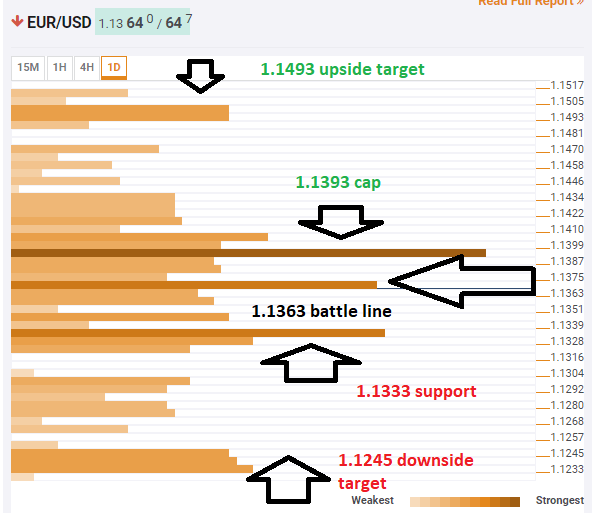 If EUR/USD overcomes that level, the next upside target is 1.1493 where last month’s high converges with the PP 1m-R1. Support is at 1.1333 which is the confluence of last week’s low, the Fibonacci 38.2% one-month, and the SMA 100-4h. The downside target is 1.1245 where we see last month’s low, the PP 1m-S3, and the PP 1m-S1 meet.